The Pinto Mesa Section of the 118 mile long Paradox trail is located on BLM land north of Nucla, Colorado. 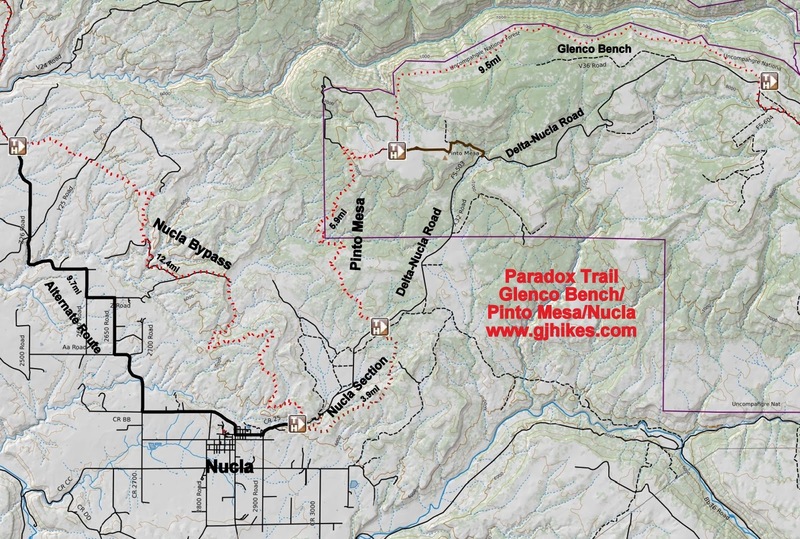 The trail begins off of the Pinto Mesa Road and ends at a point where the Paradox trail crosses the Nucla-Delta Road. A portion of the trail follows some new singletrack that was created when the original Paradox trail was rerouted due to a short trespass. To get to Pinto Mesa follow the Nucla-Delta Road north from Nucla for about 8 miles and turn left at the Pinto Mesa sign. After turning off the Nucla-Delta Road it is about 2 miles to the junction of trails 660 and 660.1A where the Glenco Bench section of the Paradox trail ends and the Pinto Mesa section begins. The trail follows the road for just over a quarter mile. At that point the Paradox trail branches off the road on the left onto an old jeep route. Someone has spray painted a D.G on one of the rocks that have been placed across the old jeep road to reduce the width to a singletrack. After starting down the old jeep road there is a Paradox trail marker screwed onto a dead log. 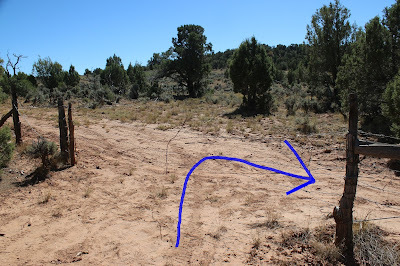 The trail has a moderately steep grade as it drops off the mesa making use of a couple of switchbacks along the way. The elevation profile shows a loss of 900 feet over the distance of 2.5 miles or so. Some parts of the trail are rocky but they are no big deal going in this direction where it is mostly downhill. Just past the 3 mile point the trail comes to another road that it follows to the left. From there it starts a steep climb out of the drainage that it is in. After leveling off quite a bit the trail comes to a fence where it turns to the right. It seemed like it should be going left at this point but there is a Paradox trail marker to the right and sure enough that is the correct way to go. Trail markers start showing up more frequently as the route comes to an old chain area where the ground is strewn with dead trees. After working around the knob of a hill the trail comes to a new section of singletrack. Up to this point the trail has been all double track. The singletrack is very well constructed and looks like it was built with mountain bikers in mind. For us it was the funnest part of the Pinto Mesa section. We ended the Pinto Mesa Section of the Paradox trail at the point where the singletrack crosses the highway. It seemed like a natural stopping point and the next section of the trail is fun enough that it deserves its own post. Besides that we were parked all the way up on top of the Uncompahgre and wanted to get back to our vehicle before dark. Originally we were only going to do the Uncompahgre and Glenco Bench sections before turning around but they were both pretty easy so we did Pinto Mesa too. 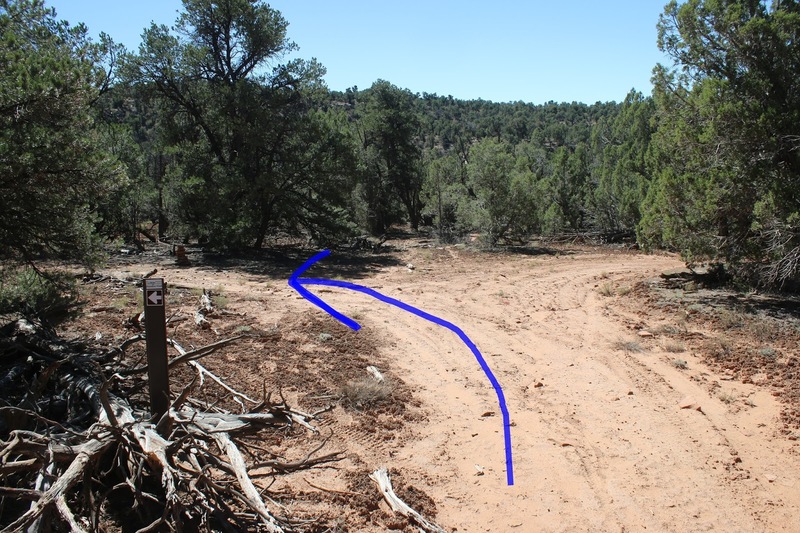 The Pinto Mesa Section of the Paradox trail would also be a nice loop ride that should come out to about 12 miles round trip with 4 miles of that being pavement. If you would like to see it for yourself then all you have to do is grab your bike or 'Take a hike'.